Spotify is getting ready to go public. Apple Music is owned by the richest tech company in the world. So where does that leave Pandora? Once a trailblazer in free digital radio, Pandora (P) was late to offer an ad-free subscription service, and now it lags far behind its competitors. Management shakeups, a sinking stock price, financial losses and customer defections have checkered its recent past. Now the company says it has a plan to turn things around by becoming a power player in the digital audio and advertising industries. It is spending $145 million an audio tech firm called Digital AdsWizz, which builds audio ads for streaming services like Pandora, Spotify and iHeartRadio (IHRTQ). It's a sign that Pandora wants to double down on the kind of advertising model that helped make it popular. Scott Walker, Pandora's senior vice president of ad strategy, said the purchase points toward a few goals. AdsWizz serves not just Pandora but some of its competitors, too. By owning AdsWizz, Pandora can expand its business interests and gain a source of revenue. That doesn't mean the company is killing off its signature brand. Walker said owning a digital ad firm helps Pandora bolster its own technology, and the company is still solidly behind its own service. A huge chunk of its 75 million listeners still use the free, ad-supported platform that Pandora has marketed for years. Its much-touted algorithm promises that you can pick a song, artist or genre, and Pandora will find music for you that aligns with your taste. But the market has changed dramatically. Several radio competitors have stumbled, including iHeartRadio, whose parent company recently filed for bankruptcy. Others, like Grooveshark, have disappeared entirely. Meanwhile, Spotify and Apple Music began offering monthly paid subscriptions that allowed users to pick specific songs and curate personalized playlists -— with none of the annoying ads. They found an audience. Spotify, which is available in many countries, says 159 million people use its service every month. About 71 million pay for a subscription. The Swedish company still loses a lot of money — around $1.5 billion last year — but it also has growth to show ahead of its anticipated public listing next week. Apple Music isn't as large. It has about 38 million paid subscribers. But has one big advantage over independent companies: It's just a small piece of Apple's (AAPL) enormous business. 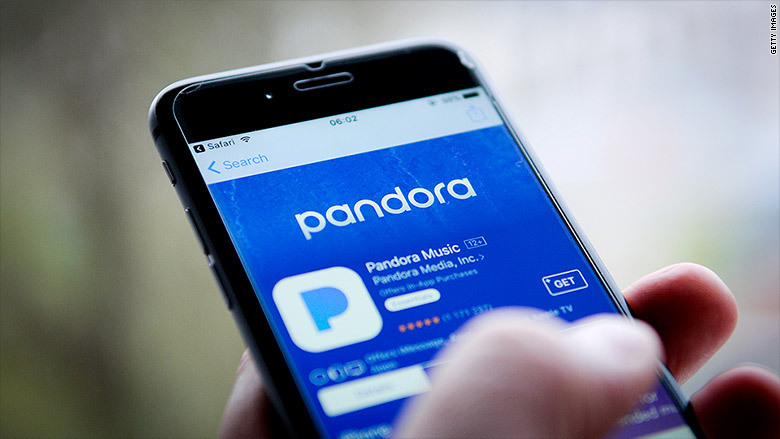 Pandora, which operates only in the United States, lost more than 6 million listeners last year, according to company filings. And its paid subscription service, which is relatively new, only has about 5.5 million subscribers. "They missed a mark," said Gene Munster, a tech analyst and managing partner at Loup Ventures. "When Pandora was just ramping, it was thought that radio was the future of how most people wanted to interact with music. And what Spotify did was add controls and sharing playlists, and they just missed that." Walker, the Pandora executive, said he doesn't see it that way. He said the company "made the right decision for us at the time." He touted Pandora's current model, which offers different levels of service. Sure, you can still listen to Pandora radio for free with ads. But if you watch a short video, you'll get a trial of its own on-demand, ad-free subscription service called Pandora Premium, a $10-per-month service comparable with what Spotify and Apple Music cost. There's also Pandora Plus, a cheaper subscription for the traditional personalized Pandora radio channels, but without ads. It costs $5 per month. "We're at the early stages of how that subscription model is going to evolve," Walker said. He said the goal isn't necessarily to convert every free listener into a paid subscriber, but to figure out what each listener wants. Michael Pachter, a media analyst with Wedbush Securities, said he wasn't yet sure what to make of the AdsWizz deal. He questioned what Pandora had to gain from buying AdsWizz outright, instead of just paying for its services. But he added that Pandora does need to find ways to make money. Although revenue has grown recently, Pandora lost more than $500 million last year. Pachter said a big part of its expenses are high royalty rates to license music for its three-level system. "I think they are just stuck with higher rates, so they are going to keep trying to do subscriptions while they can," he added. "In the meantime, at higher rates, they need to generate more ad revenue." Others suggested that Pandora as it exists might fade away. "There may still be a Pandora brand five years from now, but it's not going to be a relevant source of traffic," Munster said. He added that the company could even sell itself to another business. Last year, radio and telecom giants like SiriusXM and Verizon were floated as potential buyers. SiriusXM ended up investing $480 million, giving it a 16% stake. "I think that the company in the future is going to be more of a platform that enables radio streaming ads than it's going to be about the brand of Pandora," Munster added. "They become an arms supplier instead of someone who's actually in the fight."